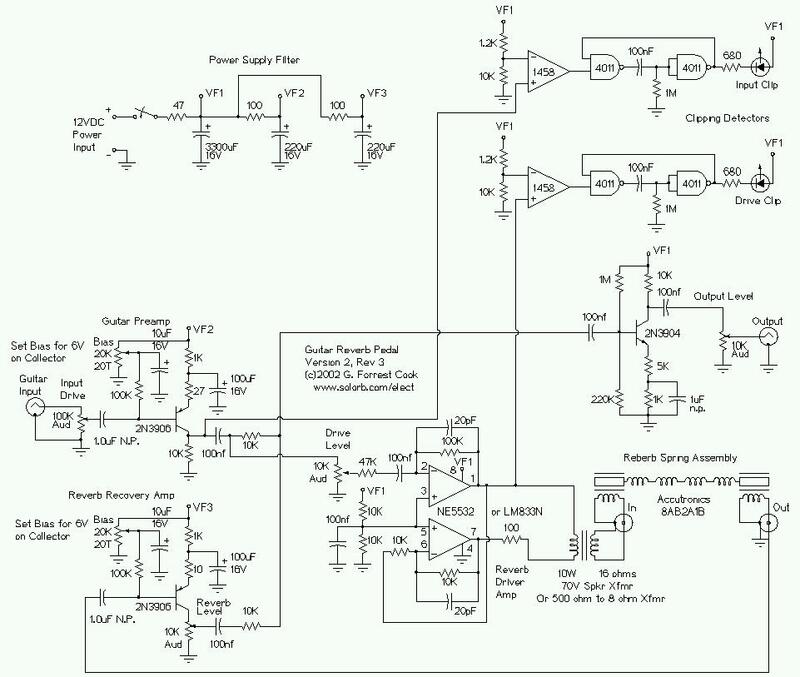 This is my second-generation solid-state guitar reverb circuit. The fidelity is much improved over the earlier design, it is suitable for use as a front-end to a guitar amplifier. This circuit features clipping indicators on the preamp and reverb recovery stages, allowing for the optimal gain settings. Input level: suitable for direct connection to electric guitars. Output level: line level, can be turned down for feeding a guitar amp. The transformer matches the impedance of the driver amplifer to the reverb driver coil and allows a dual phase driving signal to power a reverb coil with one grounded side. The transformer is a standard "70 volt" audio line transformer that is often found on PA systems. One reader reported having good results using a Mouser 42TU013 (1K to 8 ohm) transformer. If you can find a reverb tank with a high impedance driver coil, the transformer may be eliminated, the driver coil will require isolation from ground. I built this circuit using the "dead bug" construction method on a blank sheet of copper PC board material. Gaussmarkov has nicely provided some printed circuit board artwork in Eagle CAD format for the project. Plug an electric guitar into the input. Adjust the input drive level as high as it will go without causing the input clipping light to activate. Adjust the drive level control to a level below where the drive clipping light activates. Different reverb sounds can be achieved by lowering and raising the reverb drive level. Adjust the reverb level for a nice sounding balance between the dry and reverb sounds. Adjust the output level for the optimum volume level. Now go play some surf music.